On June 27, 1806, the District of Arkansas was created by the Territorial Legislature of Louisiana from the southern part of the New Madrid District. (Above) A new map of part of the United States of North America, containing the Carolinas and Georgia, 1806; and a Map of the U.S. Missouri Territory in 1813 — in present day Missouri and Arkansas from “A History of Missouri” By Eugene Morrow Violette, D.C. Heath and Company, Boston, Page 79. Here’s an excerpt from the book “Arkansas 1800-1860: Remote and Restless” by S. Charles Bolton, pp. 24-25. The United States received Louisiana from France on December 20, 1803, and on March 23, 1804, Lt. James B. Many of the U.S. Army took possession of Fort Estevan at Arkansas Post from its Spanish commandant. A small contingent of American troops was stationed there for the next four years. Little change seems to have resulted from the shift of administrations; the American officers in charge even played a role in settling civil disputes, as had their Spanish and French predecessors. 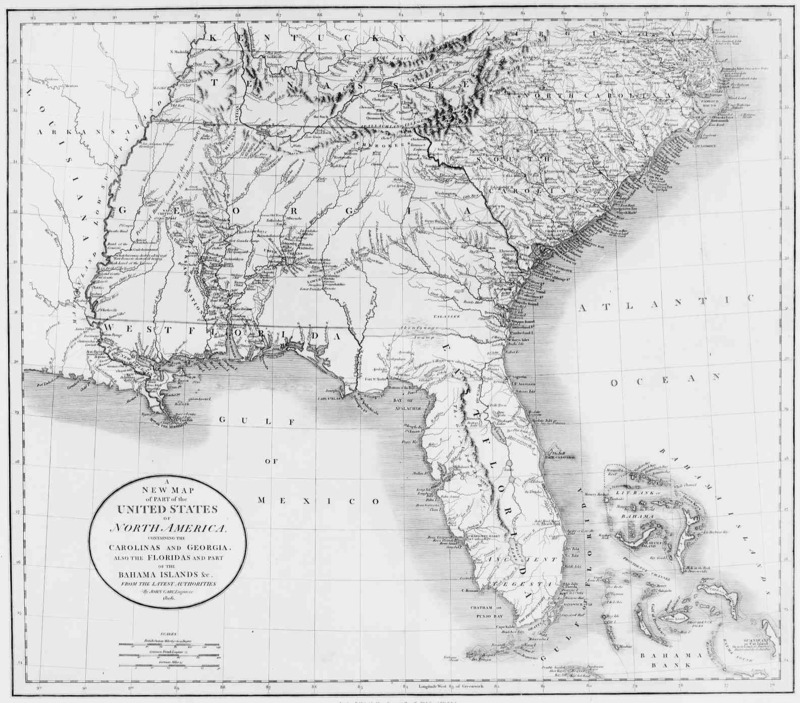 Meanwhile, in October 1804, Congress divided the Louisiana Purchase at the 33rd parallel, the present southern boundary of Arkansas, and created a Territory of Orleans in the south with its capital at New Orleans and a District of Louisiana in the north, which was placed under the control of the territorial government of Indiana. Since Indiana was still in the first stage of territorial government, it had no elected legislature; the people living in what are now the states of Arkansas and Missouri were subject to laws enacted by the governor and three judges meeting in Vincennes, on the Wabash River in what is now southwest Indiana. The following year, the District of Louisiana became the Territory of Louisiana with its capital at St. Louis, and the settlers of Arkansas became part of the New Madrid District, the southernmost jurisdiction of the territory. The town of New Madrid was some 250 miles by river from Arkansas Post, making it difficult for Arkansans to make use of the courts and other aspects of local government located there. On the other hand, there were no more than one thousand U.S. citizens in Arkansas at the time, and about half of them spoke French and had no understanding of or interest in Anglo-American law. The St. Louis government created an Arkansas District in 1806, making the first official American uses of the name that had originated in the seventeenth century, when the French first found Quapaw Indians living on what they call the “Arkansea river.” The district was eliminated in 1907, however, only to the recreated by Gov. Meriweather Lewis in 1909. Lewis also set up local courts at Arkansas Post, but their operation was haphazard, largely owing to a lack of judicial expertise. Still, Arkansas’s status was soon upgraded. In 1812, the Territory of Orleans entered the Union as the state of Louisiana, and the Territory of Louisiana became the Territory of Missouri. The next year, the territorial legislature created a separate Arkansas County with its administrative center at Arkansas Post. In January 1815, Henry Cassidy represented Arkansas County in the territorial legislature. As Arkansas grew in population after the War of 1812, it was divided into new counties. Lawrence County, covering the northern one-third of Arkansas, including the White River regions, came into being in 1815. In 1818, the St. Louis government added Clark County in the Ouachita River area of south Arkansas, Hempstead County running west of there to the Red River, and Pulaski County, covering the Arkansas River in the central part of Arkansas. (Above)Southern section of the United States, 1816; and an outline map of Arkansas counties in 1819. For more about Arkansas Territorial history, read the book “Arkansas 1800-1860: Remote and Restless” by S. Charles Bolton, published by The University of Arkansas Press. You can also learn more about early Arkansas history at the Encyclopedia of Arkansas.